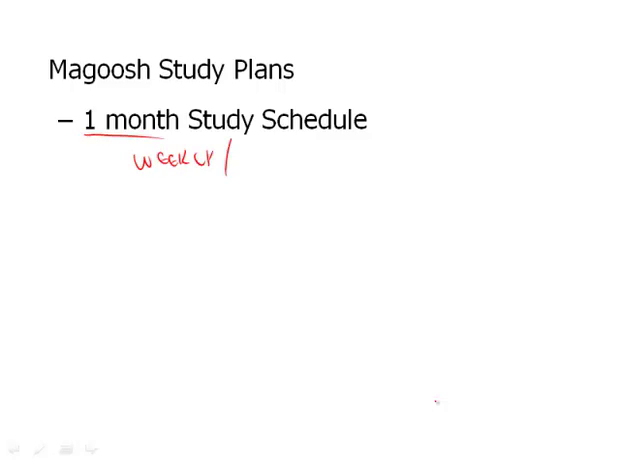 In this video I am just gonna quickly talk about our Magoosh Study Plans. But they can be very important to your GRE prepping. And the reason I say that is often times there isn't that much structure when one embarks on a GRE prep course by themselves. Even Magoosh with our lessons all arranged isn't that structured. For instance, do you do each lesson sequentially? Do a lesson in a few questions? I mean you may find yourself at sea on how to use Magoosh. So, a great way to figure out how to reign in all of this material is through the Magoosh Study Plans. And the Magoosh Study Plans are, well there's actually a bunch of them. We'll start off with the one month Study planner or Study Schedule. And what this allows you to do is say, hey look, I might only have three weeks or five weeks to prep, therefore the one month would be perfect for you. Now the one month Study Schedule has a weekly, as well as a daily plan. So it depends on how grand you are, how specific you want your study plans. And you of course know yourself best. So if you like everything to the, to the dot each day, tell you what to do, of course the daily plan is the way to go. If you need more of general guidance, the weekly plan is for you. Much the same with our 90 day study schedule. It's broken up into weekly and daily. Again, if you're studying, let's say, anywhere from two to three months, you can of course adapt or cater the schedule to exactly the amount of time you need, but this plan, the 90 day study schedule is for you. Now the 90 day study schedule even has something even more specific than the one month study schedule. Not only is it weekly and daily, but within the daily study schedule, there is a beginners. So for people just starting off. They are for those that need more help in math, so they're math-focused. But there's one for verbal. If you are really good at, are already good at math, then you should do the verbal focused plan. And then finally there's an advanced daily study schedule. So if you're making a score basically above 160 in both sections, this is the way to go. Now, these study schedules don't only give you structure, but they also tell you what's the best material out there. Meaning, you're not only going to be using Magoosh when you go through these study plans. We also have for instance Manhattan GRE's also on their vocab books, such as Barron's 11,000 Words You Need To Know is on there, et cetera. So I would encourage you, even if you're on the fence about whether to follow these study schedules or not, to go through here look through the weekly look through the daily. Look through the various daily one's if you're looking at the 90 day study schedule and see if it makes sense for you to follow this. Because again, you want to get the best score and possibly get test day and you know yourself best, so check out a study plans are the way to go. Finally, just in case we have one. It's not on here. But if you are really going for the long haul there is a six month study schedule. So there you have it. And all these study schedules are on our blog.